YIG Oscillator basics-What is YIG? The page covers YIG oscillator basics.It mentions YIG oscillator application note and vendors/manufacturers of YIG oscillator. YIG is the short form of Yttrium Iron Garnet. It is a crystal which has very high Q. This high Q characteristics provides very low phase noise and multi-octave frequency tuning . YIG crystals are developed like silicon crystals. From this small YIG cubes are made after slicing it. YIG sphere is made from YIG cubes after inserting them into a "tumbler". YIG spheres are available in 10 to 30 mils size. Typically, YIG sphere is mounted on end of conductive rod usually made of beryllium . There are two reasons for doing this. • Rod functions as tuning stick here in order to orient YIG sphere in resonant circuit. • When temperature is kept constant, YIG yields best performance. The rod basically is a thermal conductor to and from YIG sphere and a proportional heater. Let us understand how YIG works. It is a ferrite material which resonates at microwave frequencies when inserted into a DC magnetic field. This resonance is directly proportional to strength of applied magnetic field. DC magnetic field is generated with the use of electromagnet, permanent magnet or combinations of both of these. The magnetic field of electromagnet is tuned with the use of variable current. At molecular level, YIG resonance is basically alignment of electron paths. This will create combined magnetic dipole. As we have learnt current generated magneticfield while magnetic fields generate current when these are coupled to a conductive loop. This concept is used in the design of YIG based oscillators. Here small conductive loops are used which allow coupling to/from resonant magnetic field of YIG spheres. There are three methods by which coupling can be applied viz. oscillation feedback, signal transfer and rejection. The oscillation feedback is employed to generate variable capacitance and inductance in different configurations. The configurations are common gate, common base and common source oscillator tank circuits. 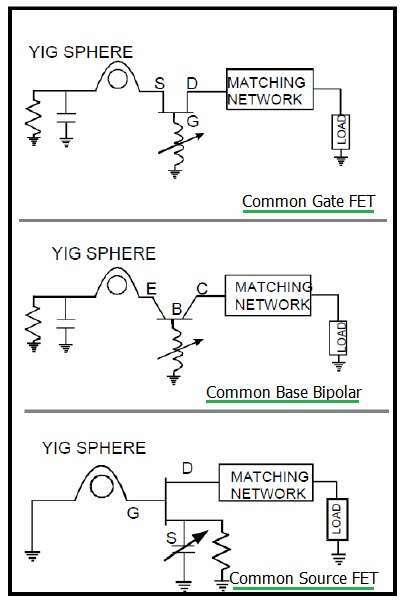 These different YIG oscillator topologies are depicted in the figure-1 above. • MICRO LAMBDA WIRELESS, INC.
• YIG oscillators will have good signal quality at low phase jitter compare to VCO. • YIG works like tank circuit when it has been placed in the air gap of electro-magnets. • Low phase noise can be achieved with YIG due to magnetic resonance. • Available is wide variety of frequency ranges which include 2-4GH, 4-8GHz, 8-12GHz and 12-18GHz and 2-8GHz. • It has more power consumption and slow tuning compare to varactor diode based oscillators.